Welcome to F1Minute for the 28th May 2011. 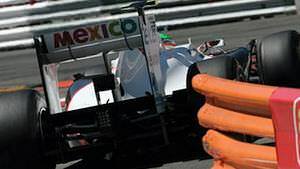 Sergio Pérez suffered a huge accident in qualifying but has escaped relatively unscathed with a concussion. In the final ten minute session of qualifying, the Sauber was exiting the tunnel already out of shape. He hit the Armco at the side of the track, which spun the car and Pérez was then simply a passenger as he sped side-on into the barriers. We’ve seen accidents like it before, but this one seemed particularly heavy. The session was red flagged as the marshals and medical staff got to work. It was a lengthy delay, but procedures are there to be followed. Pérez was extracted from the car and taken to hospital, where tests have shown he has a concussion and a sprained thigh but no broken bones. The concussion does mean he will not be able to participate in the race tomorrow, but the Mexican has already taken to Twitter to reassure fans he’s okay.